Leptipsius is in the tribe Europini, subfamily Monotominae, and is closely related to the genera Bactridium and Pycnotomina. The genus is not well-characterized, and the current generic characterization probably contains other undescribed genera from the New World tropics (Bousquet 2003b). The type species is Leptipsius striatus (Bousquet 2003b). This genus can be separated from Bactridium and Pycnotomina, which it closely resembles, by the constricted neck behind the eyes (the head is gradually narrowed in Bactridium and Pycnotomina). There are also 1-3 transverse rows of small round punctures on abdominal ventrites II - IV, whereas Bactridium and Pycnotomina have one transverse row of large, oblong punctures (Bousquet 2003b). 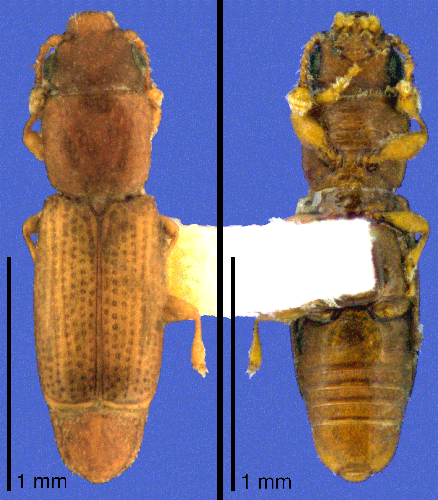 The males of Leptipsius striatus have a plaque located on the first abdominal ventrite that bears two proportionally longer setae (Bousquet 2003b). The genus can be distinguished from other, less-closely related monotomids by the round procoxal cavities, abrupt one-segmented antennal club, hidden trochantins, pronotal punctures not subcontiguous, and triangularly produced femoral lines. Little is known about the biology of Leptipsius, other than that they are found under bark. Leptipsius striatus is often collected under the bark of cottonwood poplars, and L. imberbis has been reported from under the bark of yucca and sotol plants (Bousquet 2003b). The genus as currently characterized is known mainly from the southwestern and central United States, with several other species described from Central America. Leptipsius is known from South America, but is not well-characterized and there are many undescribed species (TCM, pers. obs. ).